I’ve read through quite a few of the 2006 predictions lists. My 2006 list is more of a wish list of the technology trends/innovations that I’d like to see in 2006. Some of these are definitely going to happen. In fact, some might be announced next week at CES. With Slingbox, I have a great solution for remote viewing of my TiVo on my laptop when I’m on the road, at work, etc. Apple is off to a great start with the latest iPod and the catalog of video offerings on iTunes is growing every week. DirecTV is rumored to have a mobile video offering coming soon, Tivo is testing a new feature that will allow you to download your recorded video to your iPod or PSP, and the cell phone providers are starting to roll out video services. I’ll be a happy guy when all of my recorded TiVo shows are available on my handheld device. The big question is will that content be on my smart phone (Treo 700, Motorola Q, etc. ), on an iPod?, on a PSP?, all of the above? Most subscription music services are available on portable music players but there are additional fees. Sprint PCS is offering Rhapsody but there are additional fees and I haven’t heard great things about the audio quality. 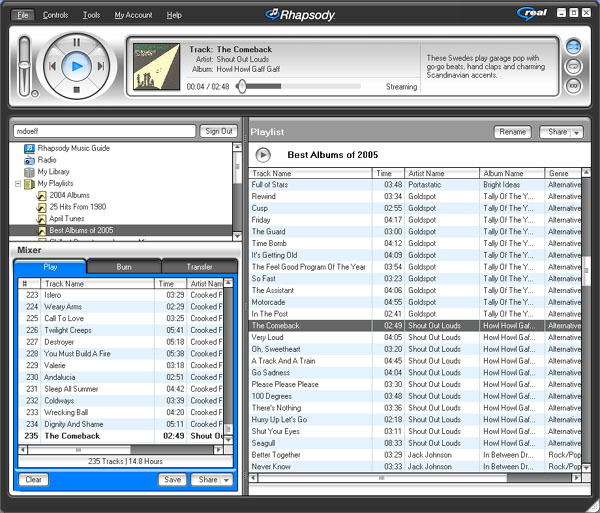 If I’m paying $10 per month for subscription for Rhapsody, I want to have seamless access to that music on a portable device (preferably my iPod or mobile phone), in the car, etc. Regarding the car option, I’d love to see Sirius or XM partner with one of the big subscription music services (Rhapsody, Yahoo Music, Napster, etc.). The other possibility here is a wireless provider (Cingular, Google?) but this would be a real technical challenge to offer continuous access to a fast-moving vehicle. 3) Wide Rollout of 3G in the U.S.
It’s no secret that the U.S. has lagged behind Asia and Europe on the rollout of 3G. Hopefully we’ll see a broader rollout of 3G services by the major U.S. wireless providers in 2006. I’d like to be able to spend about $5 per month or less for national wireless coverage. For me this means coverage in every major city in the U.S. and not just in airports, hotels, and Starbucks. If you don’t have a line-in jack on your car stereo, the best solution for listening to your iPod in the car is the cassette adapter. The FM transmitters are a decent option but the sound quality suffers and there are problems with this solution if your live in an urban area. We also need to purchase all kinds of accessories to mount our iPods in the car. We need a simpler solution. For example: Why can’t I have a 20 GB thumb drive that contains all of my digitial music. I can insert it into a portable music player (iPod or cell phone) if I’m on the go and I can insert it into the car stereo when I’m in the car. The camera on my old Treo 600 is a joke. It’s better on the Treo 650 but it’s still pretty weak. It’s time for phones like the Treo to have at least a 3 megapixel camera as a standard feature. I use a digital SLR (Nikon D70) and have been using an old Canon S230 when I don’t want to lug around my big camera. I’d much rather have this camera on my phone. Do you remember when a 1 GB flash memory card costed over $200? Now you can get one for less than $75. There’s no doubt that this trend will continue. Will we see a 100 GB iPod by the end of the year? $25 for a 1 GB thumb drive? I’ve had my eye on the Pioneer Elite 43″ plasma TV for a while now. These used to cost over $6,000 a couple of years ago. Now they are less than $5000. BestBuy has one listed today for $4,499.99. In 6 months I’ll bet this model is avaialable for less than $4,000. OK, that’s it for now. I’m sure that I’ll be adding to this list. Here’s a great cover of Wild Horses by Iron & Wine + Calexico. 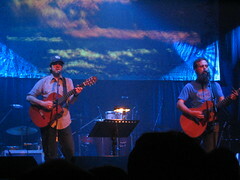 This is from their 11/30 show at the 9:30 Club in Washington D.C. You can stream the entire show at the NPR web site. Photo by flickr user gordasm. If you’re looking for other good cover songs, check out Beck’s cover of Nick Drake’s Pink Moon on Gorilla versus Bear. All of these great year-end music lists got me to thinking that subscription-based music services like Rhapsody are totally worth it if you like to listen to a lot of new music. All but one of the albums on the Gotham Gal list (the Bright Eyes album) are available on Rhapsody. I dumped all of the other albums from her list into a Rhapsody playlist and – bam! – just like that, I’m enjoying all kinds of new tunes for less than the cost of a CD. The New York times ran a good article today about my beloved Slingbox. The article mentions that there will be an announcement in January about the Slingbox being available on the Mac. It also looks like support for Slingbox on Windows Mobile is coming soon. I thought I’d try out the del.icio.us tagroll. I’m using the option where you sort the tags by frequency.